If we thought we had spent a lot of time traveling by bus on our trip through southern Spain, we were definitely in for a surprise. It took us around four hours to get from our previous stop, Sevilla, to our home for the next few days, Lisbon, the capital of Portugal. Portugal represented a new country for almost all of us on the trip, so it was definitely exciting when we crossed the border… even if our only indication that we were in a new country was that we woke up from our naps to a text saying our phones no longer worked. We didn’t arrive to Lisboa until it was dark, so all we really got to see of the city that first day was through the bus window on our way to the hotel, starting with a quick glimpse of the Christ the King statue that overlooks the city (inspired by the one in Rio de Janeiro) as we crossed the Tagus River, or Tajo/Tejo, into the city. Interestingly enough, this river was actually the same one that we saw when we visited Toledo a few months ago. At almost 650 miles long (more than 1,000 kilometers), the river is the longest one in the Iberian Peninsula, so we shouldn’t really have been surprised that we’d seen it multiple times. After making our way into the city, we saw a few key areas from the bus, like the Marquis of Pombal Square, which was dedicated to a famous Portuguese statesman who helped develop early seismology and happened to be near our hotel. Luckily our time in Lisbon would be pretty laid back. Because we would be exploring on a Monday, not much was open, so most of our tourist activities were very chill and outside. After traveling so much and doing a lot earlier in our trip, we definitely welcomed this break. 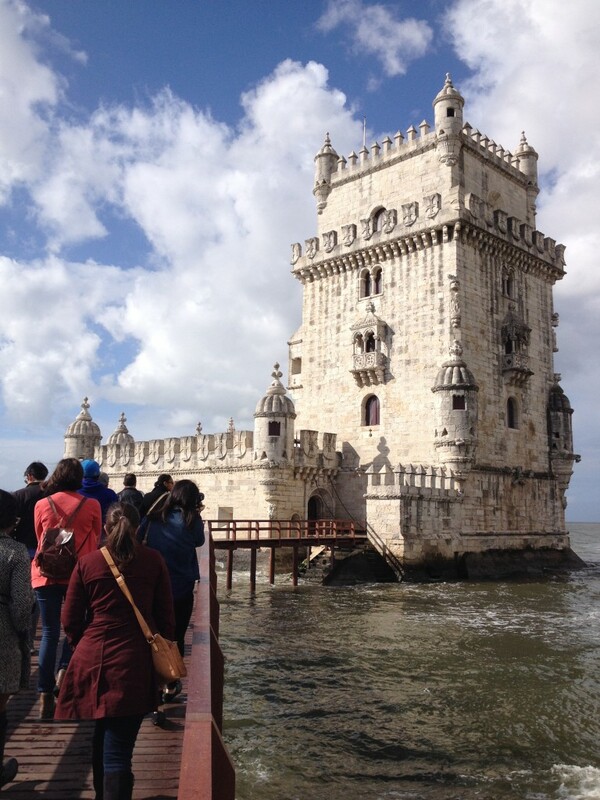 We got up Monday morning and headed to the Belém district of Lisbon, near the shore of the Tagus river and home to a few popular attractions. Our first stop, the Torre de Belém, functions as a common symbol of the city due to its history of both a customs house and a defense tower from which Lisbon’s river port could be protected, but apart from that it’s a pretty cool looking building that you now have to reach with a bridge because of the widening river. (And I’m sure the fact that two dogs were playing in the water nearby didn’t hurt our appreciation of the building either.) 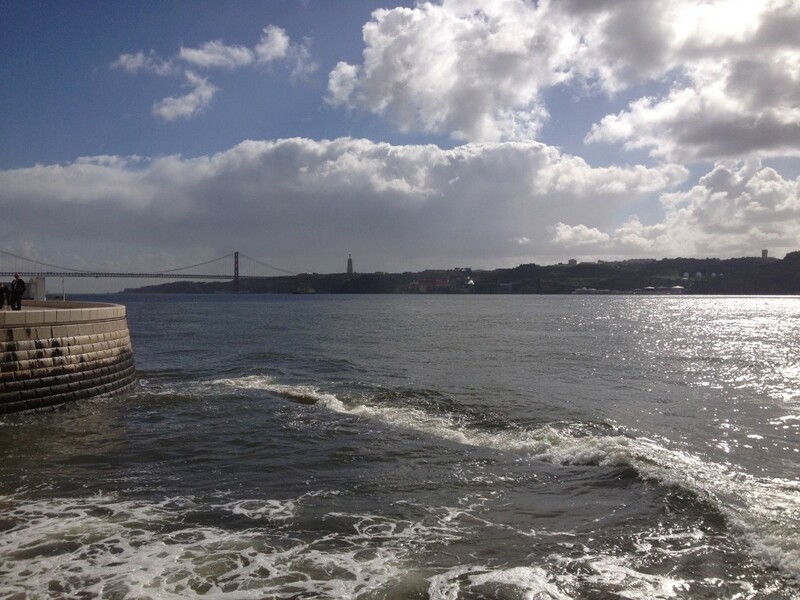 Next, we walked next door to the Padrão dos Descobrimentos, which is a monument dedicated to the Portuguese discoveries during the 15th and 16th centuries, located on the same river that those explorers must have left from. From our short time in Portugal it definitely seems like they still really value these early discoveries and maritime history as a culture; we saw many references to it and it seems part of their national pride and identity. Across the street from these two sites along the river is the large Hieronymites Monastery (Jerónimos). The monastery is another beautiful tourist attraction that represents Portugal’s history of exploration, and happens to also be the location of the signing of the European Union’s most recent treaties, the Treaty of Lisbon signed in 2007 that we learned about in my EU class. We got a chance to see some cool architecture from the outside, but it was also closed so we did not see much else. 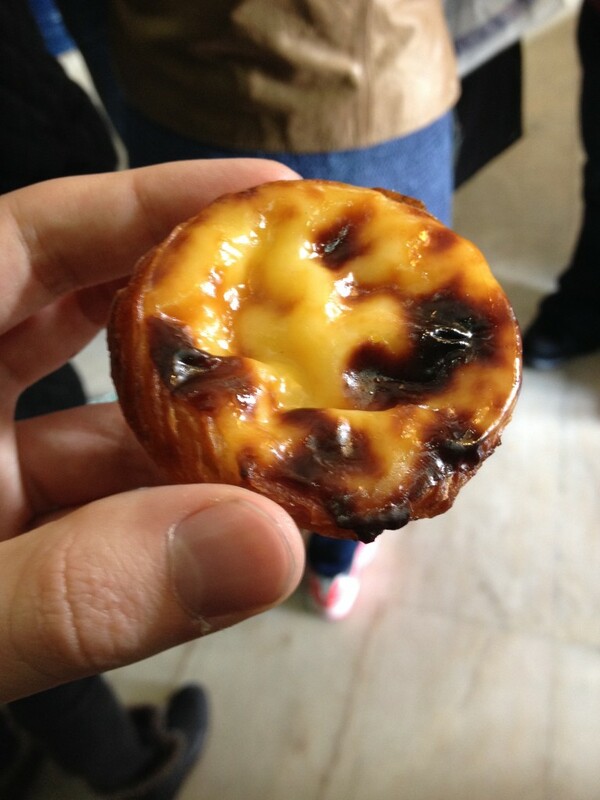 This turned out to be a blessing in disguise though, because we instead went next door to try the famous pastéis de Belém, yummy egg tarts that have since become very common Portuguese desserts. Apparently they were created by the monks from the Monsteiro dos Jerónimos with left-over egg yolks. The egg whites were commonly used to starch clothes or clear wines, but they did not have much use for the egg yolks, so they used them to make cream desserts. We made the half hour drive back to Lisbon after hanging out on the beach to see a performance of Fado, the Portuguese music genre that, like Spain’s flamenco, has been recognized as part of an important intangible part of our world’s cultural heritage in need of preserving. It took a while for us to appreciate it considering we do not speak Portuguese — flamenco is easier — but the music and singing were very beautiful. Though we could not understand most of the lyrics, they explained a little about the music genre and showed some multilingual poems explaining the content as the artists performed. Fado features mournful, almost melancholy, songs, lyrics, and guitar playing that express the Portuguese word of saudade. The word does not have a direct translation in English or even Spanish, but refers to the nostalgia or longing felt for someone or something that one loves. One of the poems described it as what remains after everything else is gone. I’m very glad we got to experience the fado and hope next time we’ll be able to understand it a little better, because the whole concept seems very intriguing and beautiful. Along the way we back to Madrid, we stopped roughly halfway at Mérida, in the Spanish autonomous community of Extremadura. Though the capital of Extremadura today, Mérida was once of the most important cities in the Roman Empire. After being founded by retired Roman soldiers in 25 BC, it was eventually one of the capitals of Roman Hispania and today has some of the most preserved Roman artifacts and monuments than anywhere else in Spain. While there, we visited the ancient amphitheater and Roman theater that are still sometimes used to this day, and we also random other parts of ancient Roman architecture spread throughout the city. The theater in Roman times was basically today’s sports, like soccer, and other cultural performance that represent such a large part of some people’s lives and allow them an escape. The Latin phrase panem et circenses, as Paco explained, shows all people really need in order to be get by are basic needs like food and entertainment. After grabbing some migas, calamari, and lamb caldereta for lunch, we hopped back on the bus and were happy to be back home in Madrid by around 7:30pm. 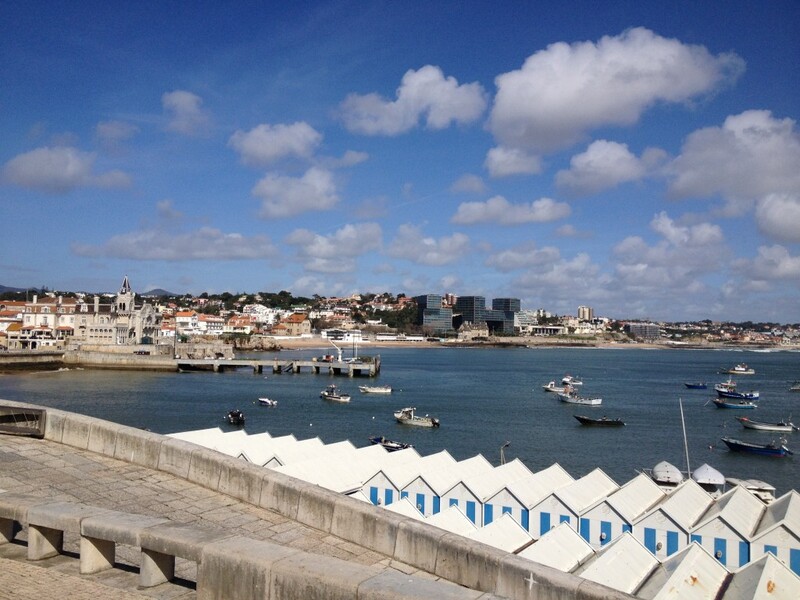 This entry was posted in Study Abroad in Madrid and tagged amphitheater, bacalao, beach, belém, belem tower, bridge, calamari, caldereta, cascaes, cascais, cathedral, christ the king, cod, dessert, discoverer, discoveries, earthquake, eu, european union, explorer, explorers, extremadura, fado, flan, food, food and circuses, hieronymites, hispania, iberian peninsula, jerónimos, lamb, lisboa, lisbon, lisbon cathedral, marquis of pombal, marquis of pombal square, melancholy, mérida, metro, migas, monastery, monsteiro dos jerónimos, monument, monument to the discoveries, music, nostalgia, padrão dos descobrimentos, pan y circo, panem et circenses, pastéis de belém, port, portugal, portuguese, pt, recording, río, river, roman, roman theater, rome, sabe ou não sabe, saudade, seismology, sevilla, tagus, tajo, tejo, toledo, torre de belém, tower of belem, treaty of lisbon, trips, tv, tv show, vasco da gama. Bookmark the permalink.